Every available man 18 and up who are practical Catholics should be a member of our Knights of Columbus...it is the best things for them and for us....ask and then ask again and again! Knights of Columbus wish you a very Merry Christmas and Happy New Year! 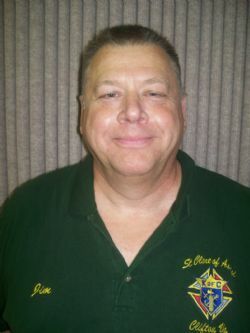 Jim Mark is a new knight to Saint Clare. He is our Lecturer and in that position, he is in charge of one of the most important part of our meetings. He makes sure that we have food! I recognized them not for the good food, but for the personal time and effort that they put forth for the Parish breakfast. They both come the day before to set up the dining area, prepared the kitchen and food, and used their talents to serve up fresh made waffles with all the fixings. Then they cleaned up the kitchen after it was all done. But there's more, Chris is a full time member of our Parish choir, while Jim will welcome you to the 10:30 mass as an usher" That's what earns them the recognition as November's Family of the Month! Jerry is no stranger to Saint Clare. He's been a charter member of the Knights of Columbus going back some 12 or so years. And he has served us in a number of way. But one of the important task he has is the leader of the Turkey Crew. See photos. Yes, Jerry has been the number one man in charge of the Thanksgiving collection for over eight years. He has done a fantastic job and we thank him a million. This year has been a great year in collecting thanksgiving dinners. With his leadership, we have collected more turkey dinners and cash then ever before. On behalf of the Council, particularly those who served with Jerry on some of the coldest days, and so, it gives me, the GK, great pleasure to recognize Brother Jerry Walsh as our November Knight of the month. May God bless you 100 times 100. 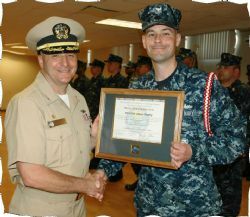 This is a recent photo of Al receiving his certificate as a Master Training Specialist, which is a highly rated certification within the Navy. Each certificate is individually numbered and managed by the Navy, and it stays with Al throughout his career. 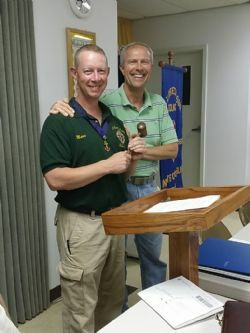 The gavel is passed in this picture from Bob to Marc at the first meeting in July. Marc is a relatively new knight and we are so proud of him. Marc would like you to attend at least one meeting a year. We meet 2nd and 4th Thursdays of the month starting with the rosary at 7:10 PM with meeting starting at 7:30 and over at 8:30 PM. 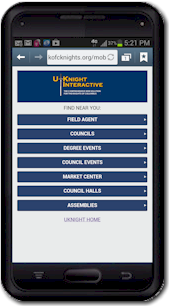 We have a social following that you won't want to miss.